NOW is a great time to start treatments! Our Experience Makes the Difference.The Permanent Choice has been performing Laser Hair Removal with the FDA-approved LightSheer™ Diode laser for over seventeen years. We have performed over 600,000 hair removal treatments in Minnesota. We are proud to say that we have the most experienced staff of laser hair removal professionals! On average each of our technicians have performed over 12,000 treatments. Experience of your technician and the technology utilized translates directly to RESULTS. All treatment information and pricing should be available upfront, by phone and email from the laser hair removal companies you are considering. Many laser hair removal companies will not share this information upfront, requiring that you come in for a high pressure sale. Financing is often used to make the monthly payment seem reasonable when in fact you could be paying up to five times more for the service. Schedule a consultation prior to having any treatments performed. Education is key. Make sure that your consultation is with the individual who will be performing all of your treatments – no exceptions. At a credible company you can speak with a technician directly over the phone and in a consultation – not a sales representative who makes a commission from the purchase of your package. The success and reduction you receive is based on three key factors – the type of device used, reputation of the clinic and the experience of the technician. What type of laser does the company use? A class four medical device has the sole engineered purpose for hair removal (Light Sheer Diode or Alexandrite). A class two medical device (IPL or BBL – Pulsed Dye) can perform different type of treatments such as: photo rejuvenation, skin tightening and hair removal. Class two devices do not have the ability to send the heat into the hair follicle to reach and cauterize the root. We highly recommend that clients select either the LightSheer Diode or the Alexandrite device for hair removal. What is the technician’s experience and credentials in performing laser treatments? How long has the technician been with the company? How many treatments have they performed? How long has the company been in business? How many laser treatments has the company performed? Always verify the company’s history with the Better Business Bureau prior to receiving treatments. Our Technology Makes the Difference! The LightSheer™ Diode was the first system to provide permanent hair reduction using state-of-the-art, high power diode technology. It is a class four medical device that can be used to effectively treat Skin Types I-IV (see below for Skin Type descriptions). LightSheer™ Diode laser is specifically designed and has the sole use of removing unwanted hair. The LightSheer™ Diode has become the “Gold Standard” for hair removal from its unsurpassed clinically documented success. The patented ChillTip™ hand-piece provides continuous cooling of the top layer of the skin for patient safety and comfort while increasing penetration of laser energy to the base of the hair follicle. Why is the LightSheer™ Diode the Best Laser on the Market? The LightSheer™ Diode has been rated as one of the top lasers on the market by leading professionals in the dermatology & skin care industry. Also, it continues to be unmatched in its clinical research (see below). It is important to note that the sole purpose & engineering of the LightSheer™ Diode Laser is hair removal. It is a class four medical device – Not to be confused with a class two medical device known as Pulsed Dye, IPL, or BBL that uses radiofrequency and is not specialized for hair removal. The Tissue Penetration illustration shows the depth of penetration emitted by various laser devices used for laser hair removal. The LightSheer Diode’s penetration is able to surpass that of an ND:Yag due to its ability to be compressed onto the skin causing the waves emitted to penetrate deeper (an ND:Yag cannot be compressed and must sit directly on top of the skin). The LightSheer Diode is capable to effectively treat all depths of hair, from your head down to your toes. Hair grows in three distinct stages in the follicle. 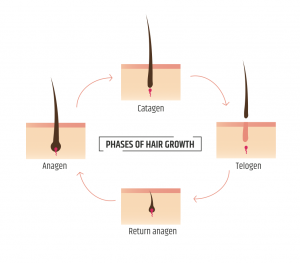 The active growth stage (Anagen), followed by the dormant stage (Catagen), and the shedding or falling out stage (Telogen). Laser hair removal is only effective on hairs in the active growth stage (Anagen). The laser is pulsed for only a fraction of a second. The pigment in the hair absorbs the laser light and converts the light to heat. The heat, in turn, damages the follicle eliminating or significantly impeding the hair’s growth and destroys its ability to re-grow. The system’s unique patented contact cooling hand-piece helps protect the skin leaving no irritation once complete. It is important to treat each follicle during the growth cycle (Anagen) for maximum hair reduction. The number of treatments required varies by individual. Optimal results are seen in 5-8 treatments, six to eight weeks apart. In order to get the most effective treatment possible it is important to avoid excessive sun exposure, real or artificial. We ask our clients to use a 30 SPF or greater and to cover the area being treated. Self-tanners must also be avoided during treatments. It is important to discuss the following medical conditions with your technician prior to treatments: herpes, lupus, melanoma, tendency to keloid, psoriasis, pigmentary problems, and previous treatments. Some medications are photosensitizing so all medications and supplements should be discussed with your technician. There is no one laser or laser-based method available today that works on white, red, or gray hair. The effectiveness of laser hair removal is based on the melanin/pigmentation of the hair. At Permanent Choice, we are proud to say that we can take you from start to finish – meaning that when the laser is no longer effective (fine and/or light, white, red, or gray hairs present) we have the capability to finish and complete your treatments with electrolysis. Electrolysis is FDA approved for “Permanent Hair Removal” and works on all skin and hair types. Recently it has come to our attention that laser centers are selling packages to clients with darker skin types, Fitzpatrick IV & V, which they are not able to fulfill. The problem with those skin types is at some point the hairs become too light and there is no longer a difference between their hair and skin color to see continued results (if treatments are done appropriately). Please make sure that if you are a Fitzpatrick IV, V, VI, (see chart below) that your technician is experienced in treating your skin type. Individuals with skin types IV, V, and VI have a higher incidence of hyperpigmentation occurring from the laser, this rate increases substantially when these clients are over and/or miss treated. If you have any question regarding your candidacy for laser hair removal please contact the Permanent Choice for a free consultation. Prior to laser sessions all hair must be shaved to the skin. The hairs in the treatment area must be shaved so the heat of the laser treatment is directed to the hair in the follicle, effectively disabling the root. Surface hair interferes with this process. A common misconception is that shaving causes hair stimulation. Numerous clinical studies have been performed in order to permanently dispel this myth. There must be a minimum of 2 weeks from the last time you tweezed or waxed the face and 4 weeks for other body areas before the first laser session. If currently tweezing or waxing – please call for more specific information. During laser treatments you cannot tweeze or wax the hair you want removed with laser. Bleaching, shaving, and depilatories can be used in between treatments if needed. It is the procedure of the Permanent Choice to wait a period of seven days pre and post treatment in the use of depilatories and/or bleaching agents. Please advise your technician if you are using bleach or depilatories in the area you are having treated with laser hair removal. For best treatment results and the safety of our clients we ask that our clients keep their skin as light as possible when having laser treatments. If you are planning on having sun exposure – real or artificial – we ask that you wear an SPF of 45 or greater and cover the area from exposure if possible. Most clients describe the laser as a rubber-band snap sensation. The actual treatment time is relatively short in duration and the discomfort of the laser only lasts while the treatment is being performed. Please be aware that if you do not feel a snapping sensation the settings are not appropriate or the hair color is not a candidate. General warmth means the settings are too low. The patented ChillTip™ located at the tip of the laser allows direct cooling before, during and after the laser light is transmitted. It actively draws off heat from the skin’s surface. Following your treatment, you may experience a sunburn-type sensation in the treated area for several hours. If the appropriate settings are reached and the hair is the appropriate color, there will be a period of little to no hair growth by the third week post treatment. Actual shedding time varies on the body area treated; ranging 2 to 4 weeks post treatment. Averaged throughout the treatments, a 15-20% reduction is received during each session. Post treatment reactions vary depending on the coarseness, density and color of the hair and the area being treated. We recommend a light exfoliation on the area being treated to help with the shedding of the hairs. After the initial three weeks there will be a period of little to no hair growth until a week to two weeks prior to your next treatment. Immediately after the treatments, there should be redness and bumps in the treatment area which may last 2 hours and for some individuals (especially with light skin) longer. It is normal for the treated area to feel like a sunburn for a few hours with the possibility of the sunburn like sensation continuing into the next day. You should use a cold compress if needed. Aloe vera gel or antibiotic cream may be suggested as a post treatment product. Please consult with your technician prior to using any products in the treatment area up to 72 hours post procedure. From 5-21 days after the treatment shedding of the burnt hair particle will occur. This is normal and hair quickly falls out. Initially it will appear as if the hair is continuing to grow, but this is the burnt hair pushing its way out of the follicle. You may help the hair exfoliate by washing and wiping gently with a washcloth. Hair re-growth occurs at different rates on different areas of the body. New hair growth will not occur for at least three weeks after the treatment. Showering/bathing is appropriate after laser sessions. However, be careful to use only tepid water and a mild soap. Skin should be patted dry and not rubbed. If having laser sessions on the underarms please wait a period of 24 hours before applying deodorant. Avoid hot tubs, pools, and public gyms 24 hours post treatment to limit exposure to harmful bacteria. Avoid irritation in the treatment area, which includes picking or scratching. You CANNOT tweeze or wax the area you are having treated during the course of your laser sessions. Pure Mineral Makeup is the only makeup that is recommended immediately post treatment.Only use fresh new makeup in the treated area. Moisturizer is recommended to be used liberally in the treatment area in order for the dead hair to be able to exfoliate from the follicle more easily. SkinCeuticals Epidermal Repair is a post laser treatment product that is used to diminish redness and restore/improve the skin. If you have any questions or concerns regarding laser hair removal or your treatments please contact us. There is No laser that has received FDA clearance for a claim of permanent hair removal. However, the LightSheer™ Diode designed by Lumenis™ was the first to be cleared by the FDA for permanent hair reduction. That is defined by the FDA as 85% or greater hair reduction. It is possible that follicles in the treated area, while not being completely destroyed, will be sufficiently disabled to the point where they produce only fine, light hairs that do not respond to further laser treatments and will need electrolysis. This information is backed by an extensive amount of clinical research and you should be wary of anyone who claims otherwise. Q: Is the LightSheer™ Diode safe in removing unwanted hair? Lasers are intense sources of light and some light reflects off the skin, so eye protection is very important. The LightSheer™ system was developed from years of research at the Wellman Laboratories of Photomedicine (one of the world’s leading medical laser research institutions). The lasers pulse is for a fraction of a second and the duration of each pulse is just long enough to disable the hair follicles. The wavelength and penetration level is designed to specifically target the melanin in the hair follicle and travels 0.0003mm in the epidermis to the root of the hair.